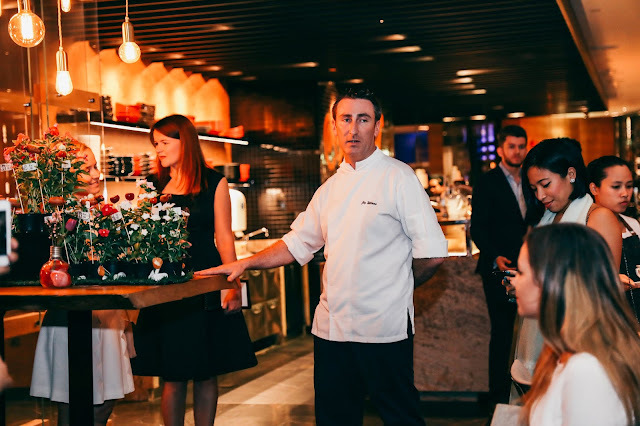 People usually talk about Japanese and Chinese cuisine as being, along with the food of Thailand and Vietnam, the best of Asia. However, Japan's northerly neighbour, Korea, would have every reason to be irked because frankly, it deserves to be mentioned too. While closely linked to Japanese and Chinese cuisine, it offers some very unique dishes, including metal chopsticks! When it comes to Korean food in Abu Dhabi, we are becoming spoiled for choice. Sura is my third foray into Korean food in the city, having tried Hankook (02 642 3399) and Mannaland (02 446 6860). 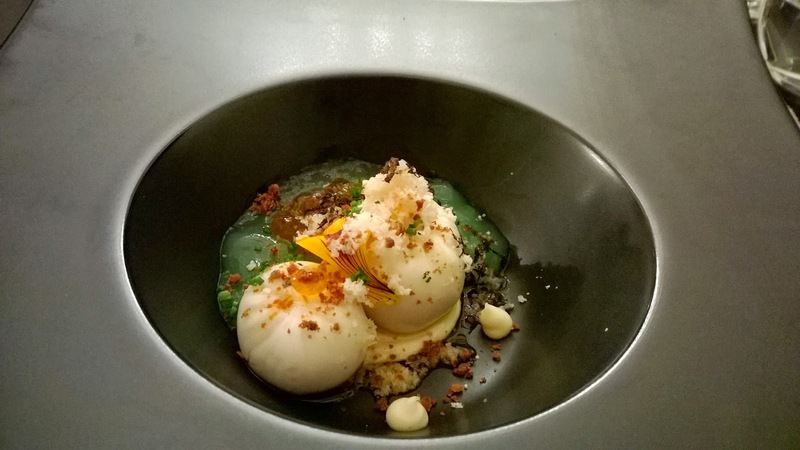 In terms of ambience, I think Mannaland with its floor seating has something special, but Sura has its own reasons why it is my best Korean food experience in Abu Dhabi. Sura is is located in the Tourist Club area and is housed in the Cristal Salam Hotel. 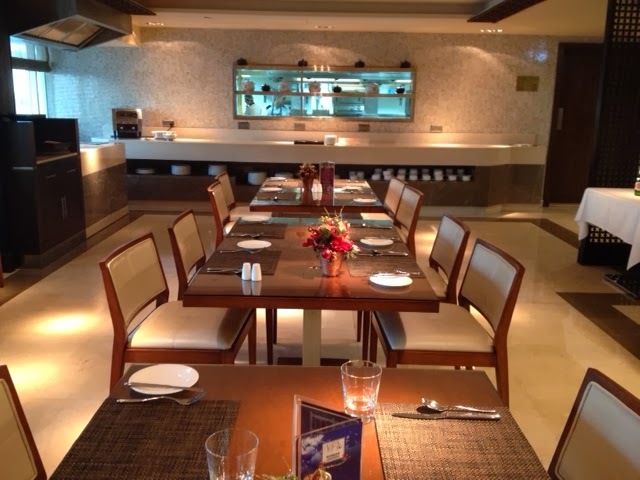 We arrived on a weekday for lunch when it was surprisingly empty. 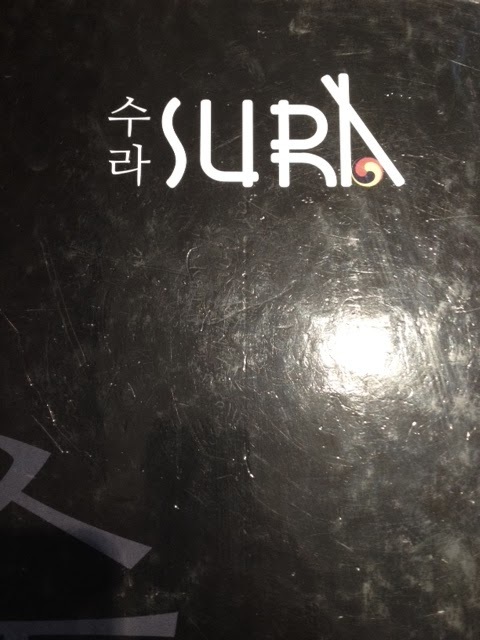 Sura offers a wonderful introduction to Korean food for those who have been curious but not brave enough to try it. Korean food is more than spicy kimchi: fermented cabbage in a variety of spices, resulting in a spicy to sour taste, but mostly spicy hot. For the uninitiated, the Lunch Special is a very good place to start with Korean cuisine. For those familiar with it, the lunch special provides at a great price, some classic Korean dishes. served with soup of the day and sticky rice. At 65 Dhs, this really offers amazing value. Price is good, but what about the taste? 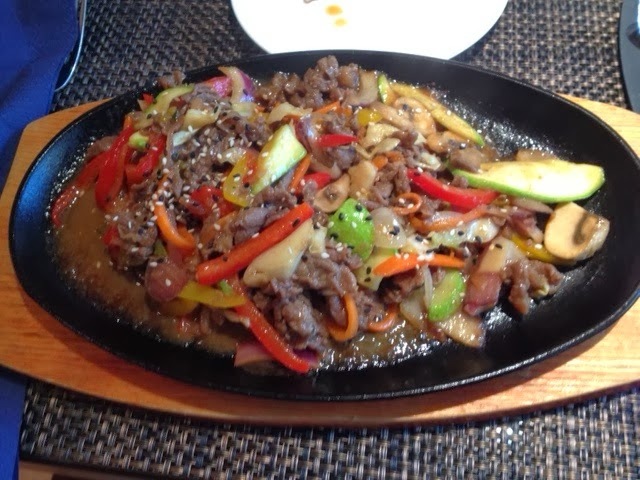 On the day that we were there, their Korean chef was away, and this was evident in one of the dishes: the bulgogi. In appearance it certainly looked Korean, with a wonderful explosion of colour thanks to the peppers. However, it was sweet, and this totally drowned out the saltiness that soya sauce usually brings to this dish. A false note definitely. On the other hand, all the other dishes took me back to my time in Chunju more than 12 years ago. 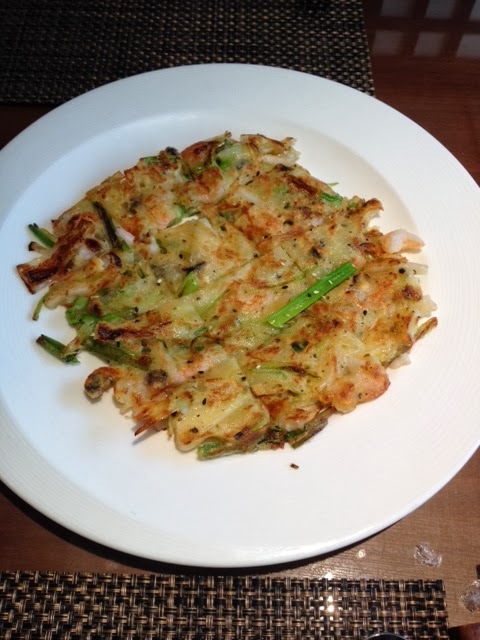 Seafood and spring onion pancake. 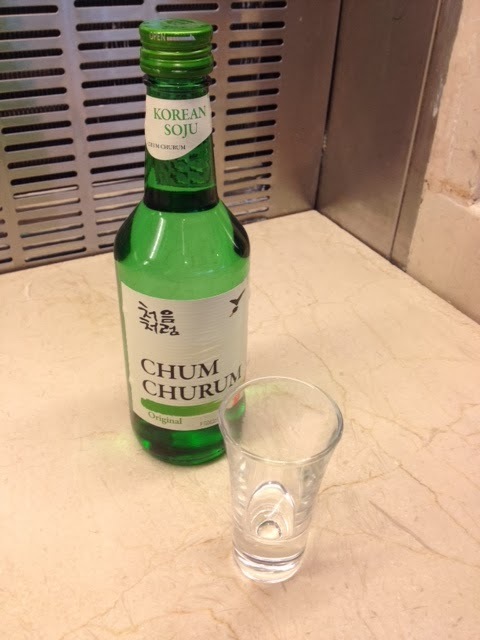 While I did not indulge this time, it is nice to know that Sura is fully licensed and offers typical Korean drinks, including soju and makoli. 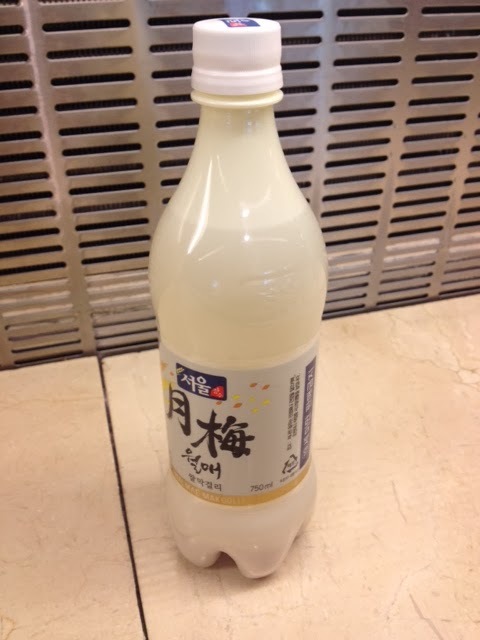 I was also pleasantly surprised to see that they offer Hite, Korea's favourite malty drink. However, I did allow my self my favourite Asian sweet indulgence, green tea ice cream. I wish I did not though. Whereas the green tea ice cream at Toki in The Hilton is close to perfect, this was not. It tasted icy and had only a hint of the green tea flavour. A fun but edgy drink. Overall though, Sura is a place that I would definitely visit again. It may not have tables which allow for in-seat BBQing like Mannaland or Hankook, but it offers wonderful service. Also, it is not often that a South Korean restaurant in the UAE can boast a Korean waitress, adding to that feeling of authenticity Furthermore, their a la carte menu looks very extensive, and based on the one a la carte dish we ordered, the grilled salmon fillet, I am very keen to try the menu. The salmon had a beautiful golden brown crispy skin offset by a tender underside. Finally, Korean food needs to be enjoyed with those Korean drinks, something that Sura offers. Because there are only 4 Korean restaurants in the city, you could easily try all of them. Overall, I would recommend Sura from the 3 I have tried. You should try it too and you will be able to say you know more than just Samsung and LG!